I LOVED this book! I thought it was really good, it was well written and topic was well understood and written in a way that is understandable to virtually any reader. Although its biting social and political commentary makes it a true contender for a permanent role in the zombie genre, its format causes it to drag like the living dead. This is going to be a really short review. There's a lot that I could mention regarding this book, but really, it's the kind of book that is best experienced first hand. 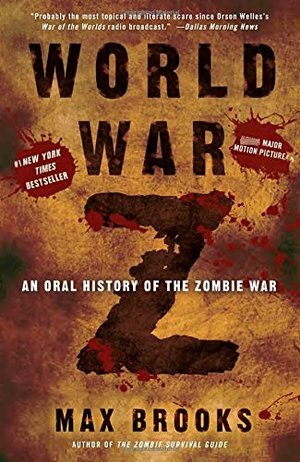 Max Brooks makes this book so incredibly believable and real and plausible, that based simply on that, this book would be a 5 star read for sure. But, that also translated into some... less than thrilling reading at times, and I found myself stalling out on the book during some sections. It was really GOOD, but sometimes I just wanted more action and less technical gun and MRE and BDU and M-1117 description. But then again, this is a book of interviews about peoples' experiences before, during and after the zombie war... so that stuff is important to them, and important to why they are here to tell it. So there you go. I thought that the audiobook version, while abridged, was not "better", but more focused on the horror aspects and therefore more enjoyable on those terms. But I still gave it the same 4 star rating I'm giving this edition... just for a different reason. This book is expertly written, amazingly detailed and very, very believable. That's worthy of 4 stars even if the pure horror aspect is slightly less enjoyable because it's slightly more buried under the rest of the stuff that MAKES it believable. If that makes sense.